This is the polish that initially drew me to the Eat. Sleep. Polish. Alice Collection, which is odd as I'm not normally into pink polish. The Queen's Croquet is a mid pink holo, the holo isn't as obvious as it is in the others in this collection, but it is peeking out. It was also a denser polish and only required 2 coats. 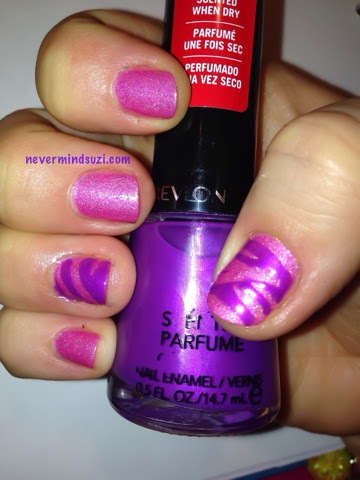 I also had some fab zebra vinyls from here and wanted to try them out so I use Revlon - Grape Icy that I bought in Poundland on top.